We all know how important it is to stay in shape, and most of us would love to have better toned muscles, but that doesn’t mean that we think of exercise as a fun, or even addictive, activity. A new gadget, known as the Powerball, may just change all that. It is a handheld gyrospcope, about the size of a tennis ball, and using one can help to tone arms and even rehabilitate damaged limbs. Furthermore, it’s one of those devices that is very hard to put down; once you start using using it you’ll be reluctant to stop – meaning more exercise for you, plus leaner and stronger arms, wrists and shoulders as a result. 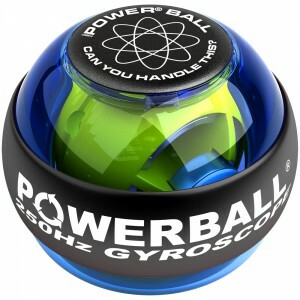 The Powerball contains a computer balanced flywheel; as soon as you start it up, the internal rotor activates inertial forces proportional to the amount of energy you expend spinning it. There is no motor and no batteries; all of the energy comes from you. Depending on the speed of rotor, this 300 gram device can generate as much as 40 pounds of resistance. Of course, that doesn’t mean that you have to put your arm through that kind of strain if you don’t want to. 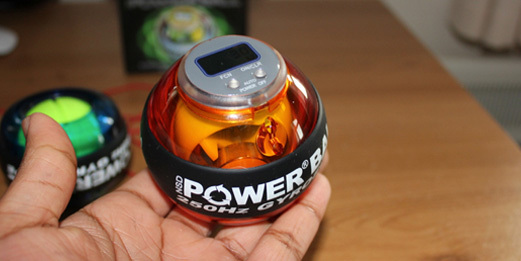 The Powerball only reacts to the amount of energy you put into it. As a result, it is also a great means of providing gentle exercise for damaged limbs. Of course, if you really want to go for it, spinning a Powerball can help you tone the muscles in your wrists, forearms, upper arms and shoulders. There are different models of Powerball, but most of them have a digital display so you can see exactly how fast you are spinning and keep a record of your success. What are the benefits of Powerball? One of the key benefits of using a Powerball is that it is a non-impact hand exercise – particularly at low speeds, so it doesn’t pose any risk to joints when used slowly. This makes it an excellent tool for rehabilitating forearms and wrist joints that have been affected by carpal tunnel syndrome, repetitive strain injury or arthritis. On the other hand, if you want to build up muscle in your arm, you can go for it with your Powerball exercise and there is the potential to see dramatic results fast. Ideal as a way of exercising your arms, strengthening your fingers, wrists and shoulders, and toning your muscles: it’s no wonder that many people find using their Powerball so enjoyable that they don’t want to put it down.